© 2009 by Robin M. Diaz. All rights reserved. On 12 August 1972, while birding Virginia Key, Dade County, Wally George spotted a large black hawk with white on the tail, flying at a high altitude. He alerted the birding community to the hawk's presence but not until 13 January 1973, while at the Interama Tract-Greynolds Park in north Dade County (eleven miles north of Virginia Key), did Wally get a definitive look at an adult hawk similar to the one seen five months earlier. Its tail was distinct — white, including uppertail-coverts, with the exception of a black sub-terminal band. He not only identified the bird to species, but he also determined the race: Great Black-Hawk, nominate South American race (Buteogallus urubitinga urubitinga). 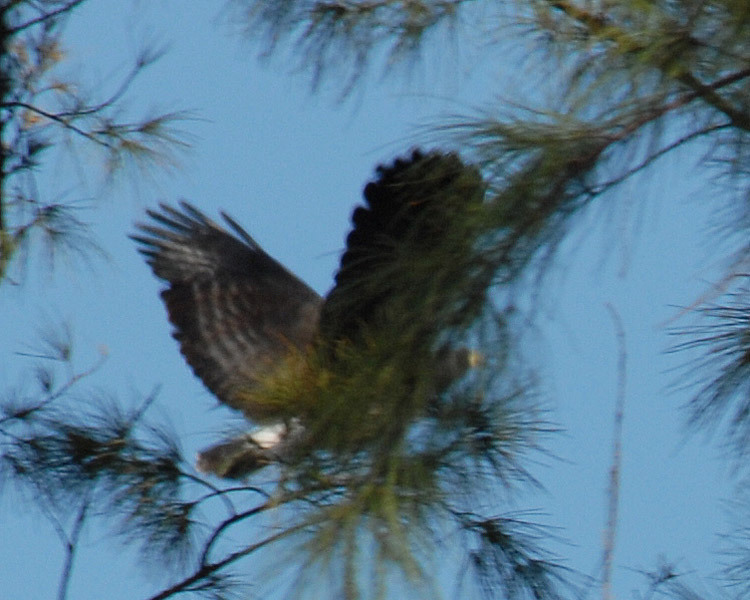 Even though Wally nailed the identification, birds fitting his description from Virginia Key and Greynolds Park throughout the 1970's and 80's were reported as Common Black-Hawks (Buteogallus anthracinus), probably of the Cuban race (gundlachii). 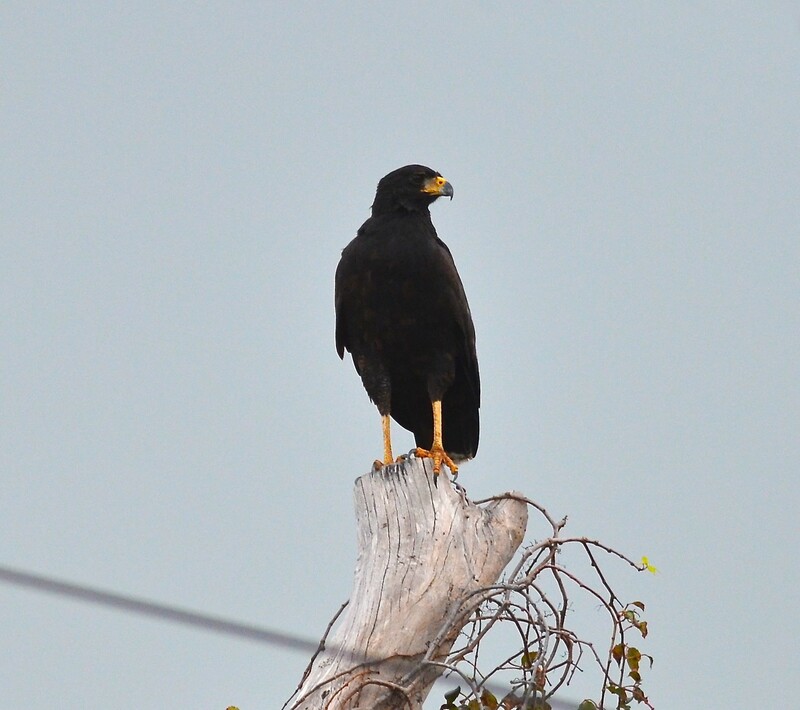 As of 2007, this race is considered a separate species, Cuban Black-Hawk (Buteogallus gundlachii). Even sightings of large dark hawks in the Keys and the Marquesas seemed to get lumped with the Virginia Key and Greynolds Park birds. Mickey Wheeler observed a similar bird 18 January 1991 and 22 June 1994 on Virginia Key and identified it as Great Black-Hawk, South American subspecies. However, the adjectives “mysterious, ghostly and problematic” continued to adhere to black-hawk sightings in South Florida. During 1973 two different pairs of adult birds were observed on Virginia Key and at Greynolds Park. Adult birds were also observed along the Dania Cut-off Canal and at West Lake mangrove area, both in Broward County. Wally observed an immature bird at the Interama Tract in the 1970's and Mark Trafton photographed an immature bird in Greynolds Park on 3 May 1975. Nick Speizio later photographed the Greynolds Park immature bird in November 1975. Thus, breeding of these black-hawks in Dade and Broward Counties was presumed during the mid-to-late-1970's, although actual nesting could not be established. Christmas Bird Counts conducted in Dade County in 1974-5 and 1975-76 recorded Common Black-Hawk, two in 1974-5 and one in 1975-6. Although CBC participants reported black-hawk sightings a few times from the late 1970's through the 80's (M. Wheeler, pers. comm. ), none of these observations made it into the historical data. Not until 2003-4, when I observed a Great Black-Hawk on Virginia Key, was any other black-hawk reported on South Florida Christmas Bird Counts. 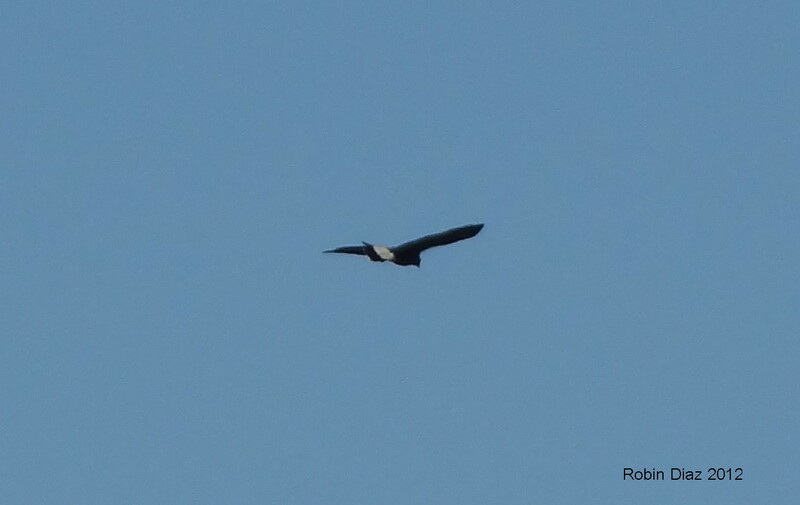 A soaring bird, identifiable to species and race, was seen and reported on the following 2004-5 Virginia Key CBC. Other than sightings in 1991, 1994 (Mickey Wheeler) and 1995 (David Lysinger) of Great Black-Hawk on Virginia Key and a soaring bird over Matheson Hammock in 1993 (Jeff Weber, Juan Villamil), I found little evidence of reported black-hawks in South Florida through the 1980's and 90's. Jim King, who observed the birds regularly on Virginia Key as well as Greynolds Park, transferred to another park in west Miami-Dade County and had no additional sightings. 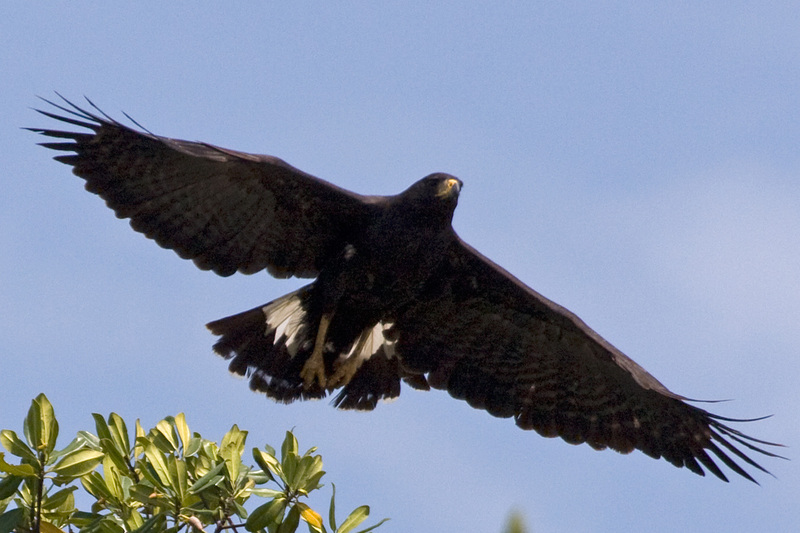 Until I observed and described a black-hawk as a Great Black-Hawk, South American race (Buteogallus urubitinga urubitinga) on 20 December 2003 during a CBC on Virginia Key, the bird(s) seemed to fade from current observations. Abby Darrah and I carefully observed a Great Black-Hawk the following year, also during a Virginia Key CBC. 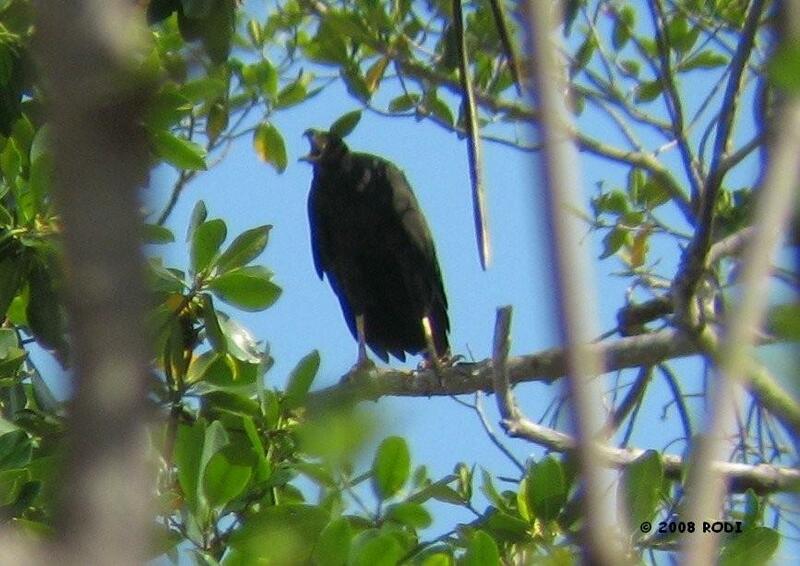 In spring 2005 John Boyd observed a Great Black-Hawk on Key Biscayne that appeared to be urubitinga race. The bird remained elusive, though seen occasionally (L. Manfredi, R. Torres, T. Mitchell, pers. comm.). The bird retained its mysterious aura until 8 January 2008 when I observed and photographed an adult. 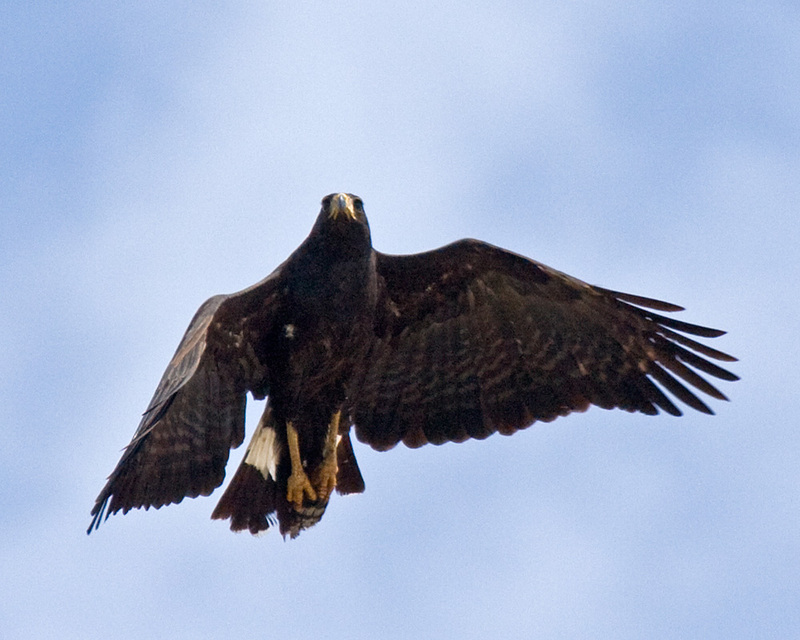 Great Black-Hawk is a large buteonine with short broad wings, short tail and long legs. The adult (sexes similar) is black, while the juvenile is streaky brownish. It seems to have a sluggish, labored wing beat and is comfortable walking on the ground. Habitats for this bird are varied, and the South Florida birds were (are) are usually seen near coastal mangroves. Buteogallus urubitinga urubitinga (South American, Southern, Eastern, nominate race) is slightly longer-winged than the Central American race. The lores are yellow (or bleeds yellow, as with the Virginia Key bird), the uppertail-coverts and whole basal half of the tail are white. The tail is sometimes described as white with a wide black sub-terminal band. A diagnostic field mark is that the feathered “thigh” is plain black. While this race is described as having plain black wing-linings, I found that there is subtle black-on-black patterning on the wings of the Virginia Key bird. The tail pattern and the lores of the Virginia Key bird fit this race, as well as the lack of “thigh” barring. The Virginia Key bird also shows a narrow white terminal tail band. These field marks have been observed, noted and photographed during my many observations of this hawk in 2008. Buteogallus urubitinga ridgwayi (Central American, Mexican, Northern, Western) has slate-colored lores with wing-linings and “thighs” marked with fine white spots or barring. The tail has white uppertail-coverts but it is inconspicuous and separated from a broad median tail-band. Descriptions from my notes include various sightings: large, black hawk perched; short tail with narrow white terminal band; bright yellow cere and light yellow legs; white tail patch obvious (especially flying) that seemed to extend up to rump area; broad wings obvious when flying; apparent very long legs; subtle light and dark pattern noted on wings; lores seen well — yellow bleeding into loral area; white uppertail-coverts seen well when bird perched facing away. Great Black-Hawk, Central American race (Buteogallus urubitinga ridgwayi): This bird's tail pattern does not include a large white basal area of the tail; its lores are dark, sometimes described as slate; white barring on the “thighs” is diagnostic; the wing-linings usually have white spotting. 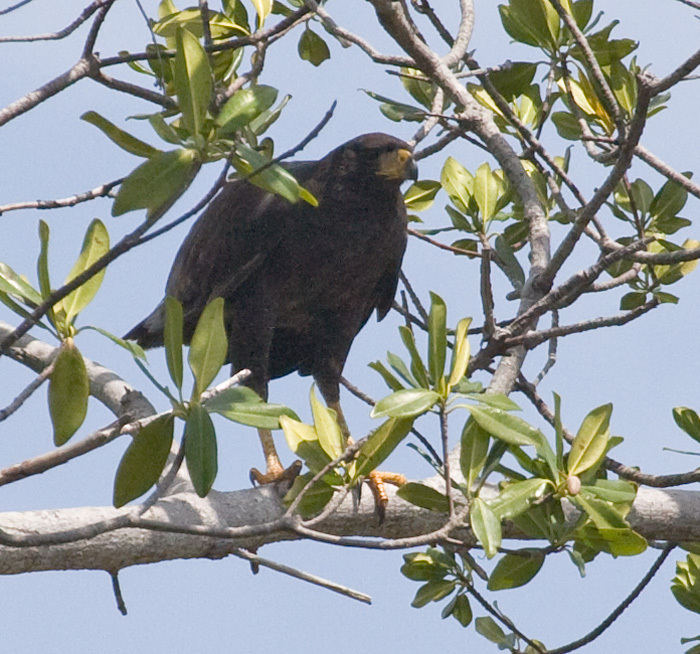 Cuban Black-Hawk (Buteogallus gundlachii): This bird is dark chocolate brown, not black; it has a white patch at the base of the primaries that is easily seen when in flight; its tail pattern includes one white median band and narrow inconspicuous uppertail coverts; usually, a thin white malar streak is visible; its vocalization is a unique “ba-tis-ta” call. Common Black-Hawk (Buteogallus anthracinus): This is a smaller black-hawk with shorter legs; it has a white patch at the base of the primaries that is easily seen in flight; its tail pattern includes one white median band and narrow white tail tip but it lacks white uppertail-coverts. 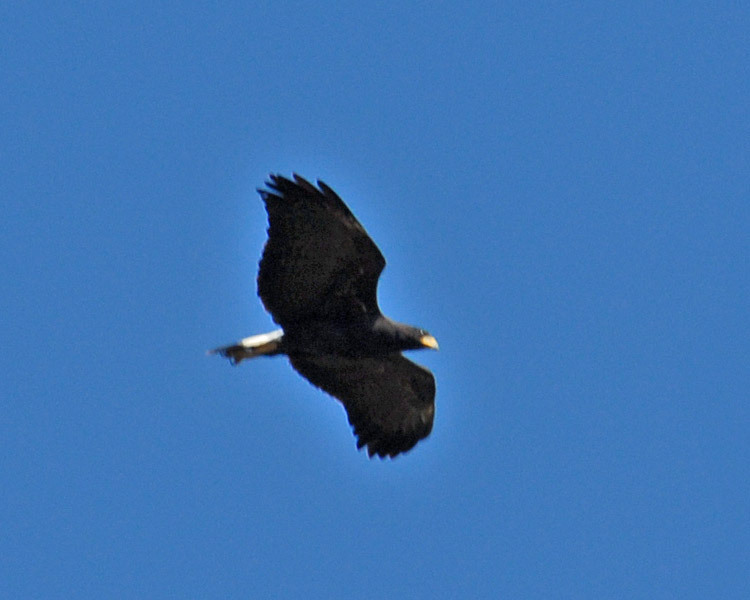 When the Great Black-Hawk is present, it is usually noisy. I observed the bird only one time calling in flight. When perched, it seems to have three distinct vocalizations: 1) 5-7 loud, quick, even pitched “kee” calls, slightly faster than an Osprey; 2) weak, high-pitched, descending plaintive whine; and 3) loud staccato call lasting 6-7 seconds, slightly ascending, then descending. I observed the hawk on the ground one time for 10 minutes and during this span it gave all three calls, albeit shorter and softer versions than when the bird is perched. Of the two Great Black-Hawk recordings I have, “Birds of Southwest Ecuador” (John V. Moore, Nature Recordings) is a good match. The calls on “Voice of Costa Rican Birds” (David Ross and Bret Whitney) are unlike those I hear from the Virginia Key bird. I am unable to establish a relationship between the bird's behavior and its different calls. However, it seems to give the staccato “kee” calls immediately after landing on a high perch and does not call with plaintive whine until it has settled for a few minutes. My Virginia Key observations to date are of a solitary bird. It is either perched, coming up off the ground or flying to or from the immediate area. A 10-minute observation 4 August 2008 was the only time I saw it remain on the ground. This was also my only observation of the bird eating, although distance prohibited me from identifying the food source. Four Black-necked Stilts were nearby, calling but not flying around the hawk. Other waders (Reddish Egret, Great Egret, Tricolored Heron, Snowy Egret) were within a 30-yard range and seemed unperturbed by the hawk's presence. I have seen no evidence of courtship display or nesting behavior. I only observed the bird soaring once, 18 December 2004. Interaction with other birds has been noted: 1) harassed by American Kestrel while perched 20 December 2003; 2) following (chasing?) a Red-shouldered Hawk for approximately 50 yards on 29 January 2008; 3) being harassed by Black-necked Stilt parents on 29 June 2008; and 4) on 7 August 2008 it seemed to respond with its plaintive whine to a calling Red-shouldered Hawk, then flew to the area and immediately flew back to mature mangrove stand where it continued to respond to calling Red-shouldered Hawk; when the Red-shouldered stopped calling, the Great Black-Hawk called fewer times, with more pauses between vocalizations. 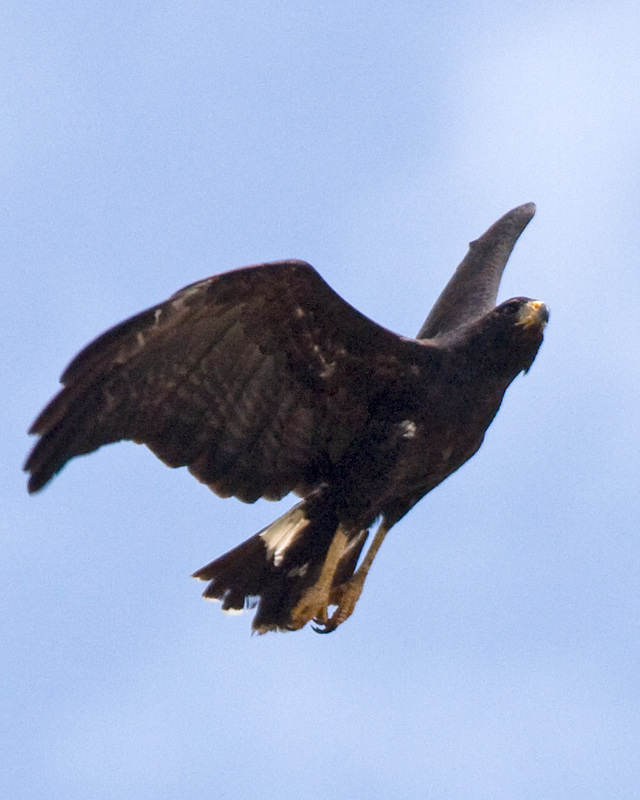 Between the reported CBC sightings of 2003-4 and 2004-5 and the current 2008 sightings, I have seen a Great Black-Hawk on Virginia Key only one other time. The bird perched briefly along Crandon Boulevard on 10 December 2006. This is the western border of Bear Cut Preserve, a dense coastal mangrove area less than a quarter of a mile from Virginia Key. Other than one sighting in the coastal dunes, the bird is consistently seen near or in mature mangroves. 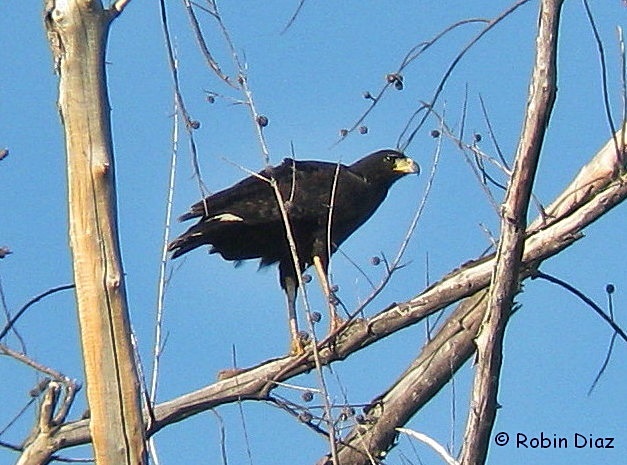 While doing a preliminary survey of Virginia Key restored areas on 8 January 2008, I observed and photographed a perched Great Black-Hawk. After it flew, I relocated it and at that time, I saw the tail pattern well and concluded that it was the nominate race of Great Black-Hawk (Buteogallus urubitinga urubitinga). Between 8 January and 4 August 2008, the Virginia Key bird has been observed and photographed 20 times, to my knowledge. The habitat is restored wetlands, mature mangroves and mixed secondary growth with scattered dead Casuarinas. The provenance of Great Black-Hawks seen in South Florida during the past thirty-six years has been examined and frequently picked apart by ornithologists and birders. In examining notes and observations from the 1970's and 80's, it now appears that Great Black-Hawk (Buteogallus urubitinga urubitinga), rather than Cuban Black-Hawk (Buteogallus gundlachii), was the species seen on Virginia Key as well as Greynolds-Interama. Knowing what is here does not answer the question of “How?” Since the South American race of Great Black-Hawk is more-or-less sedentary and is the farthest from Florida of the black-hawk species, natural agency seems a big stretch as a means for the birds' presence. Rumors persisted for years that the hawks were escaped birds from Crandon Park Zoo, then later, Miami Metrozoo. Jim Dunster of Miami Metrozoo checked records for both locations and reported that Great Black-Hawks were never displayed at either zoo or gardens (E. Alvear, pers. comm.). The time span of thirty-six years adds an interesting facet, as it is improbable for a single buteo-like bird to survive in the wild for this length of time. In 1995 P. William Smith, one of the most experienced observers of exotic birds in South Florida, expressed an opinion that the Great Black-Hawks reported from this area throughout the years were escaped from captivity, whether accidental or deliberate releases (M. Wheeler, pers. comm.). I wonder if a misguided falconer from the 1970's released his bird from duty, after time and again, the hawk returned with its preferred prey, a land crab. Indeed, Great Black-Hawk is considered a part of Florida's exotic avifauna (Pranty 2004) and a bird to which the Migratory Bird Treaty Act does not apply (Trapp 2005). While there has been no proof of nesting, they may have experienced very limited breeding. We continue to use “mysterious” when describing its origins; meanwhile, we enjoy its exciting and majestic presence. 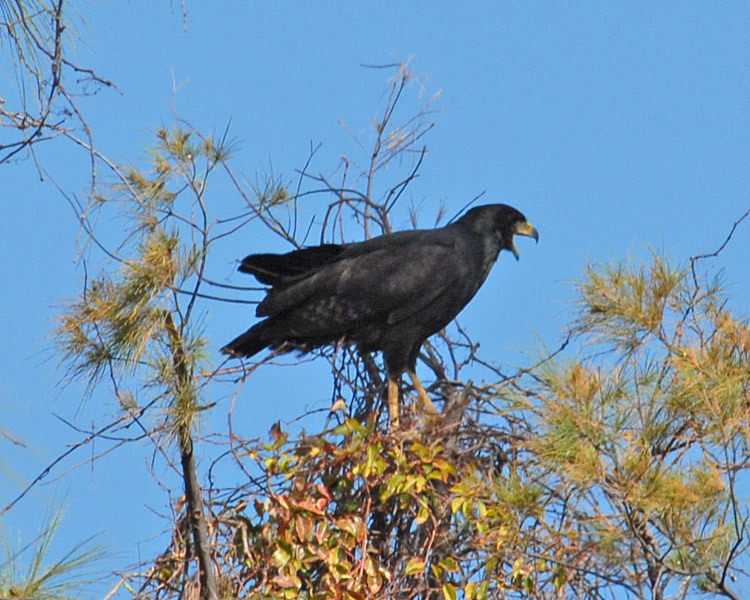 From 2009 through 2015, the Virginia Key Great Black Hawk was seen and photographed periodically, including during Christmas Bird Counts. My personal sightings included approximately ten times a year, but rarely during summer months. Its behavior remained consistent with previous observations but if Fish Crows were nearby, they would mob the hawk. Blue Jays also disliked its presence. It did not seem skittish and allowed fairly close observations. 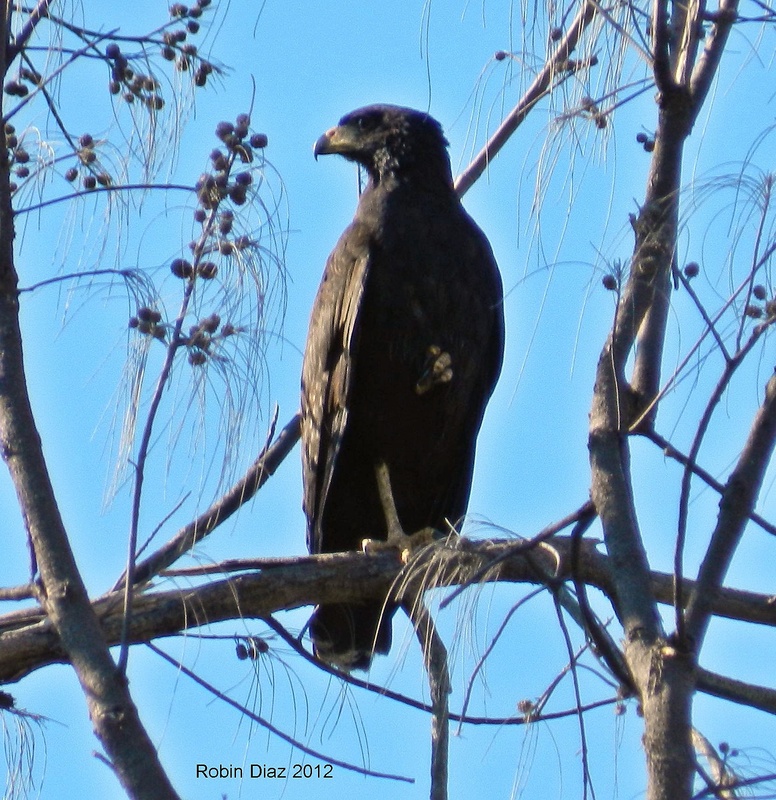 I last saw this Great Black Hawk in November 2015 but when birders visit Virginia Key, we all continue to search and to hope for another sighting of this exciting and majestic bird. I wish to express my sincere thanks and appreciation to Wally George for his continued encouragement and generosity with his notes and records, to Mickey Wheeler for her notes and helpful comments on the narrative, to Jim King for his detailed notes and observations, to Fred Lohrer for his research help and to Tricia Auffhammer, Bonnie Ponwith and John Boyd III for their gracious generosity in sharing their photographs. Abramson, I. J. (1976), The Black Hawk (Buteogallus anthracinus) in South Florida, American Birds 30, 661-662. Daniels, B. E., and L. and D. Hays, and J. Morlan, and D. Roberson (1989), First record of the Common Black-Hawk for California, Western Birds 20, 11-18. Ferguson-Lees, J., and Christie, D. A. (2001) “Raptors of the world”, Houghton Mifflin, Boston, MA. Garrido, O. H., and A. Kirkconnell (2000), “Field guide to the birds of Cuba”, Comstock Publishing Associates, Ithaca, NY. Ogden, J. C. (1975), The nesting season: Florida region [Summer 1975 report], American Birds 29, 960-963. Pranty, B. (2004), Florida's exotic avifauna: a preliminary checklist, Birding 36, 362-372. Ridgely, R. S., and J. A. Gwynne, Jr. (1989), “A guide to the birds of Panama”, Princeton University Press, Princeton, NJ. Robertson, W. B., Jr., and G. E. Woolfenden (1992), “Florida bird species: an annotated list”, Florida Ornithological Society Special Publication No. 6, Gainesville, FL. Stevenson, H. M., and B. H. Anderson (1994), “The birdlife of Florida”, University Press of Florida, Gainesville, FL. Trapp, J. L., (2005), Documenting the Occurrence of Human-Introduced Bird Species of Non-Native Origin in the United States and its Territories United States Fish and Wildlife Service.